Even the most minimalist man deserves a distinct accessory to take his wardrobe to the next level. Our 8mm benchmark satin finish titanium wedding ring with polished trim is peerless in quality and sheer sophistication. With this ring on your finger, you will look and feel your absolute best. Compared to rings made from precious metals, our men’s benchmark satin finish titanium wedding ring with polished trim is much more affordable. Titanium is used in a wide variety of aeronautical applications because of its low density and ability to withstand extreme temperatures. Titanium is very lightweight, easy to wear, and offers superior resistance to corrosion, scratching, and discoloration. Do you have skin sensitivities to certain metals? Titanium is hypoallergenic and safe to wear! Our 8mm benchmark satin finish titanium wedding ring with polished trim can help you elevate your ensemble in an effortless way. The highly polished center trim looks positively radiant while surrounded by rounded edges and a satin finish. 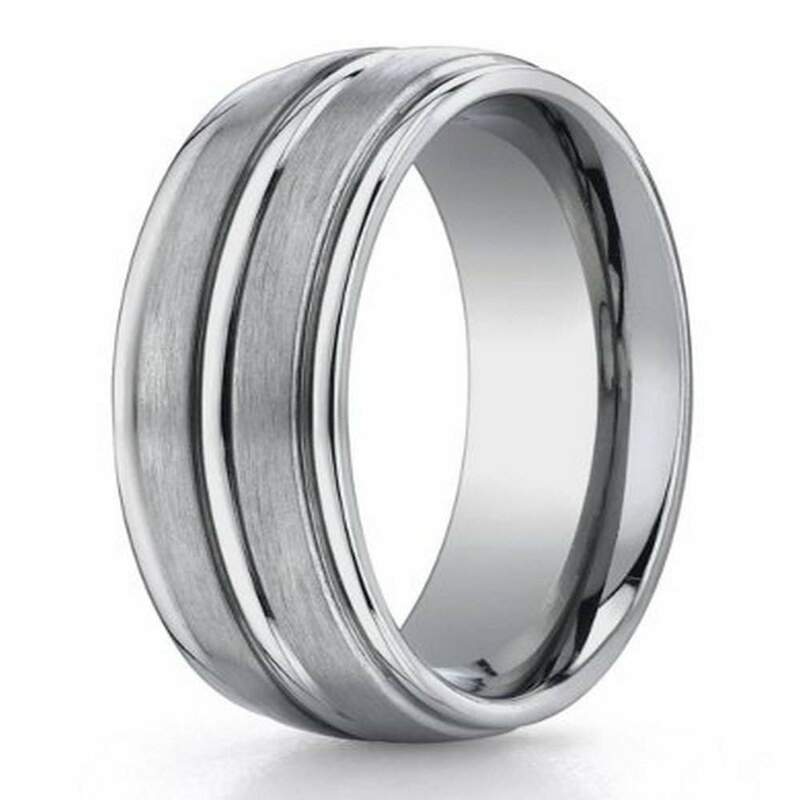 Each men’s benchmark satin finish titanium wedding ring with polished trim we offer is made with a comfort fit band. Men usually prefer comfort fit rings, because they can easily squeeze over large knuckles in the event of an emergency or while working with your hands. Comfort fit rings tend to run a half size smaller than traditional rings. We recommend that you have your finger sized by a professional jeweler before making your final decision. If you have any questions, we are here to help. Please contact JustMensRings.com today for further assistance. The pictures of this ring do not do it justice. If you want a ring that is masculine and classy, then this is it. The comfort fit together with its light weight lets you forget you're wearing it, yet it can take a beating without scratching or becoming deformed. The ring arrived promptly from JMR.com and the engraving was perfect. If I ever lose it, I'll definitely use JMR again to replace it with the same model. The ring was very nice but the color is darker than the picture shows. I was a little disappointed with that, but my husband loves it anyway. When I placed this order I needed it kind of fast. It also needed to be engraved. The company was great with follow up on this for me, the ring came a day sooner then they said it would and it's perfect. It's much better in person then the photo. Also I love that the engraving can be seen very well. I'm 110% happy with everything from this company and if I'm ever in need of another ring this will be my first stop.